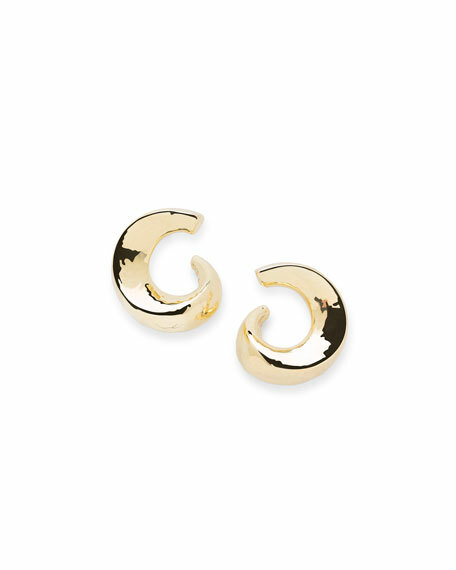 Signature Ippolita hand-hammered 18-karat gold. Orbit wavy hoop earrings by Alexis Bittar. 10-karat yellow gold plating over brass. Wavy rows with crystal pavé at center. Orbit wavy hoop earrings by Alexis Bittar. 10-karat yellow gold plating over brass. Wavy rows with crystal pavé at center. Post backs for pierced ears. Approx. 1.6"L; 1.5"W. Imported. Ippolita #3 hoop earrings from the Rock Candy® Collection. Signature hand-hammered sterling silver. Bezel-set dark amethyst, clear quartz and African ruby doublet, clear quartz and turquoise doublet, orange carnelian, and orange citrine. Approx. 1.7"L x 1.5"W. Post backs for pierced ears. Imported.